This edition of Eating Around Town was written by Abbey Becker. Abbey previously wrote about El Chucho. She lives near Eastern Market. 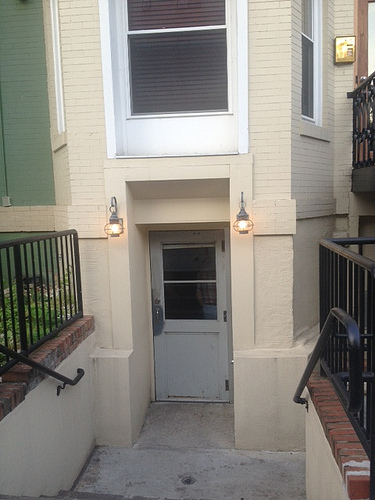 Little Serow (1511 17th St NW) is a sliver of a place, but its size doesn’t match its reputation. The basement restaurant seats 28 at a time, and if you want to sit on one of their bar stools, you have to get in line before the 5:30 opening time each night to put your name down. As someone who gets off at work at 5:30 in Bethesda, making it here in time proved a challenge the first time. I got there at exactly 5:30 on a Friday (so I left work a little early…) and stood behind probably 15 people. While I was looking for a table for four, I figured, hey, 15 people in front of me? We’ll at least get a late reservation. Unfortunately, this was not to be the case–they couldn’t give us a table that night, though they might have been able to seat us at the bar around 10 or 10:30. I was not willing to wait five hours for a full meal that may or may not have happened. The next time, I went on a Wednesday evening, and I sent my boyfriend on ahead of me to get in line before 5:30–he gets out of work much earlier. We tried for a table for two and ended up with a 7:15 reservation, which gave us time for a drink or two around the corner. If you’re looking for cocktails or beer, you may want to drink them before you sit down for dinner. Little Serow doesn’t serve cocktails, and they offer 5-ounce pours of their beers from bottles at $5 each. Don’t get me wrong–a six-course meal for $45 is a great deal, especially when the food is as good as it is here, but that much for a small pour of beer is, to me, a little ridiculous. I wish they’d at least made it a deal to buy the bottle instead, but each large-format version of the pours was $24. Wine ranges from $10-$12 per glass, which isn’t outrageous, but when you’re a young, semi-poor diner and you’re already paying $45 for dinner before tax and tip, you start to consider using your credit card instead of your debit card. That being said, we had a really excellent dining experience. Let me reiterate that it is an experience here, not just dinner. The service is like nothing I’ve experienced in DC–there were a few waitresses circulating throughout the restaurant, and we interacted with all of them. Each one served us at least one dish, refilled our water, or gave us more sticky rice or cucumbers. Each one offered a friendly suggestion of how she liked to eat that dish or mentioned that this dish was her favorite. They made us feel welcomed and not at all like we were guests–we could have been at a friend of a friend’s house for the first time. There’s no point in reviewing individual dishes, as the fixed menu changes weekly. It’s always six courses, it’s always $45, it’s always Thai food, but that’s where the commonalities stop. As someone who is a somewhat picky eater, let me give you a bit of advice: don’t read the menu. When I saw some of the ingredients included in that night’s dishes, my stomach turned a little. Snakehead fish? River weed? Salted fish? Yuck. But seriously, none of these dishes tasted at all like what I imagined these ingredients to be. Maybe there was snakehead fish mixed with the bamboo shoots and rice powder, but to me, all I got was the crunch of the shoots and the hot-sour-salty-sweet combination typical of Thai food, plus a bit of smokiness. Little Serow is the kind of place where you make a point to try everything you’re served, whether or not you think you’ll like it, because you know that they are the masters of their craft. They are going to make these ingredients taste as good as they can possibly taste because they have that skill. Its chef-owner, Johnny Monis, just won a coveted James Beard award. He knows how to cook river weed properly. I’m not sure I’d go back right away, or even in the next few months. This was a process from before the meal to its end. You’re not guaranteed a seat and you’re eating a six-course meal–this is the kind of dining experience that takes planning and patience, even on the part of the diner. I think I’d need a bit of time off to be willing to risk not getting a spot, and to truly appreciate what a good meal this was. I know I won’t be able to afford Komi anytime soon, so perhaps I’ll be back sooner than I think to try Monis’s cooking again.